Now that you've selected the right pump and reel, it's time to take control. Ideal for dispensing motor oil, ATF and gear lube, these metered valves can be used to deliver pints, quarts, liters or gallons with precision. 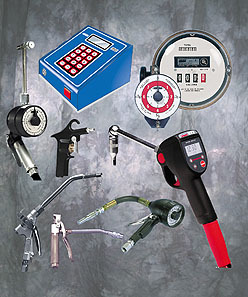 Dial controls or digital readout, the technology even offers preset options on some models. These industrial strength hose reels are designed for applications that require high product flow and/or longer hose length. Models available to work with hose lengths up to 75'. 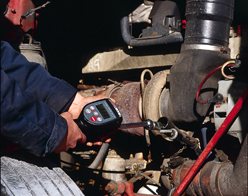 Ideal for service trucks, transit facilities and large fleet shops. Fuel Reel Assemblies with super-duty reels in complete assemblies with hose and nozzle are also available. 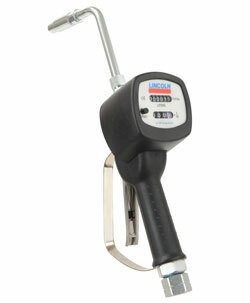 SKF is pleased to introduce its Lincoln odometer-style mechanical meter for indoor and outdoor fluid dispensing applications. Featuring an odometer-style mechanical readout, the offering comes in either a liter-or quart-measurement version. The non-resettable totalizer lets you keep track of product usage over time. Model 4482(1) Pump, Reel and Meter Package.